Provides an anatomically neutral standing base with supporting heel cradle and arch bridge. Minimizes shock upon heel strike through progressively formed columns while promoting stability and distortion resistance over the life of the shoe. Molded midsole columns, shaped and positioned to acomodate the torsonal mid-foot loads. Independent suspension elements flex fore and aft, creating a dynamic cushioning effect with positive ground feel. Stiffen and support the toe area to assure positive push off and prevent distored curl up in the toe of the shoe. CIS exemplifies Michael Toschi’s demanding commitment to fuse performance, luxury and technology. 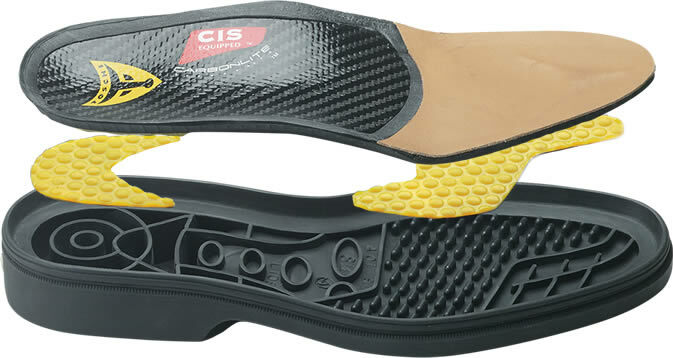 CIS is the world’s first support based in/out sole integration platform, providing durable comfort and positive ground feel. The CarbonLite insole provides a stable, anatomically neutral foot platform. The Ionet Suspension outsole contains four independent response zones favoring the dynamic anatomical movements of the foot’s gait. With CarbonLite Ionet Suspension, geometry favors anatomy.